Electrical Connectors | Compression Lugs | Terminals | Solderless | Cal Fasteners, Inc.
Cal Fasteners stocks a huge selection of electrical connectors for various applications. Our inventory includes high quality, high performance compression lugs, terminals, solderless connectors, and more, manufactured by some of the most trusted names in the industry. All connector products are available in a range of configurations, sizes, and capacities. 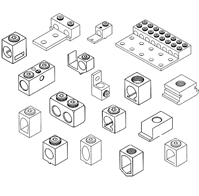 If you are not sure which electrical connector is right for your unique needs, feel free to contact us—we’ll help you find the ideal connector for your application. Request a quote on the electrical connectors you need, or contact Cal Fasteners to learn more. of our customers, suppliers and partner vendors.